Magnifying the image displayed on his helmet visor, Shas’O Kes’Ath studied the Gue’la defensive line ahead of him. The enemy’s primitive armored vehicles belched black, acridic smoke, making their deployment obvious. His troops had the technological advantage, Kes’Ath thought, but the numbers of Gue’la soldiers concerned him. With the defeat of the Tau navy in orbit above, his supply lines were severed, and he was desperately short of the armor that could match his enemy’s. The Tau commander sighed. No matter. The Greater Good demanded that the city ahead be seized, and so it would be. Turning, Kes’Ath signaled his subcommanders to attack …. The First Battle of Malati was fought on Dar Sai, an Imperial-held world in the Sculptor System. On 3 335 735.M41, Imperial forces under the command of Sub-Captain Gregorus Konstantin successfully defended the port city of Malati from a Tau invasion force, although fighting would continue for several weeks before the city’s fate was determined. Although this naval action was costly–with the loss of a Tyrant-class Cruiser and Firestorm-class Frigate, the Imperial naval victory drove Tau vessels out of the Sculptor System and cut off Tau ground forces from support. A planned attack on the world’s Northern Defense Lasers was postponed by the Tau commander, Shas’O Kes’Ath, who realized he needed access to the agricultural and industrial resources of the city of Malati to the west. Thus set the stage for the next phase of the Tau invasion of Dar Sai. When the Imperial Guard launched a counterattack to blunt the Tau advance, the 2nd Armor Co. led the charged–but its accompanying infantry was devastated by Kroot and Crisis Suit fire. Tau forces began their advance on 3 285 735.M41, but the undeveloped forests to the west of the Hanui Valley, lacking major transportation routes, forced the xenos to leave behind their heavier armor and rely on more mobile Crisis Suits for heavy support. Meanwhile, Kroot auxiliary troops played a pivotal role in scouting for their xeno masters. The xeno movement did not go undetected. As the senior ranking officer of the Astra Militarum, Captain Stevrous Stark of the 728th Cadian Regiment had assumed command of all Dar Sai’s military assets, with the aid of Imperial Guard commissars who overrode the objections of more senior militia and PDF officers. 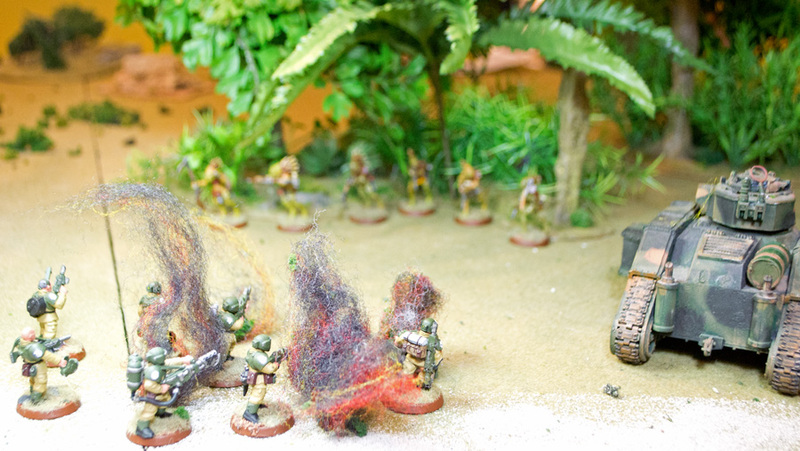 One of Stark’s first actions in command, about two weeks before the Tau move, was to order scouts deployed around the Hanui Valley in hopes of discerning the xeno’s next military steps. Orbital surveillance provided by the victorious Imperial Navy reported that significant Tau forces had left the valley and moved west, but given the heavy forest canopy in the region, it was Stark’s scouts who ultimately determined Tau’s next target. With clear evidence that Malati was the xeno’s target, Stark redeployed elements of the 728th Regiment to the city and set up a defensive position outside the suburbs. The 2nd Armored Company, equipped with Lemon Russ tanks, arrived to bolster the Imperial positions only the day prior to the Tau attack. One of the more controversial decisions of the war occurred just prior to the battle. On the same day that the 2nd Armored Co.’s final detachment arrived in port, Stark was ordered to report personally to Commodore Hennard in orbit. Despite a strong objection from the junior officer that this was the worst possible time for him to be absent from the battlefield, Hennard, as senior officer, forced the issue under Imperial Military Code 7328.503425(c-3), and Stark reluctantly turned over command to his able and aggressive assistant commander, Sub-Captain Konstantin. Thus Stark was to miss this important battle for control of Dar Sai. Even before the sun rose over the soon-to-be battlefield, the Tau were advancing on the Imperial position. The majority of xeno forces were concentrated on the right flank of the Imperial line, and these troops began a cautious advance through the forests that dominated that side of the Tau position. If the xenos thought that their advance was undetected, they were mistaken. Imperial armor, backed by infantry, swept forward to strike at the Tau advance. This attack began well, but the faster contingent of Lemon Russ tanks of the 2nd Armored Co. outpaced the accompanying infantry, A Co., exposing the Imperial Guard troops to intense fire from Kroot infantry and the hit-and-run strikes of Tau Crisis Suits armed with burst cannons. On the Imperial left flank, Imperial commanders observed no sign of xeno activity, other than a small demonstration of force by xeno skimmers (Piranhas), and began a cautious advance, their troops quickening their pace as it became clear there was no serious resistance. 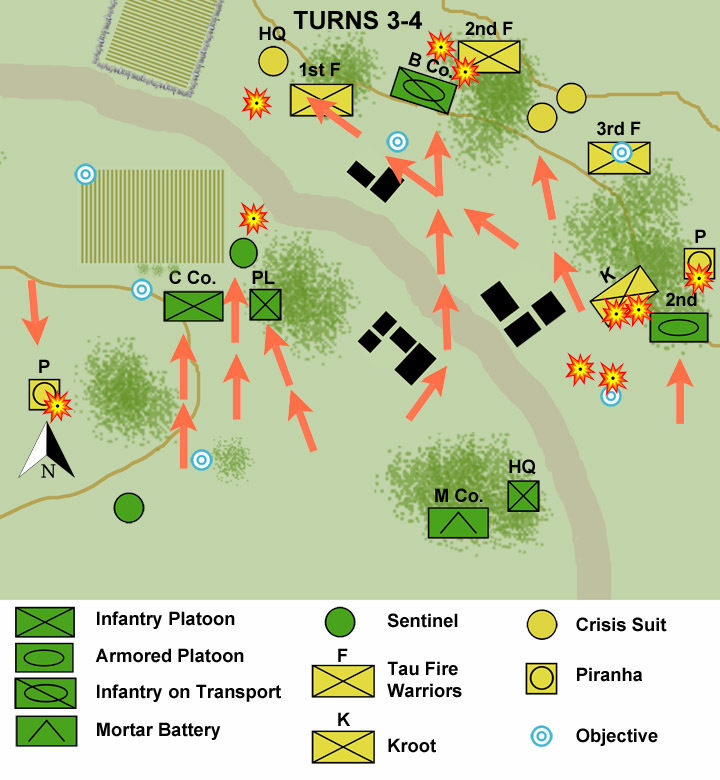 This advance, led by C Co., had the goal of securing a position to the north where, the day previously, a column of Imperial tanks have been destroyed, their valuable wrecks abandoned in no man’s land. As the day progressed, xeno fire devastated A. Co. and drove back the infantry unit. Without this infantry support, the Imperial counterattack waivered. Yet, despite resistance, the 2nd Armored Co. regrouped, drove back an attack by Tau Piranha, and took the unprecedented decision to enter the thick forests to drive out the xenos, despite the risk of being bogged down in the thick undergrowth. Meanwhile, Chimera-mounted infantry, B Co., sought to stymie Tau attempts to reinforce the battle against the Imperial armor. 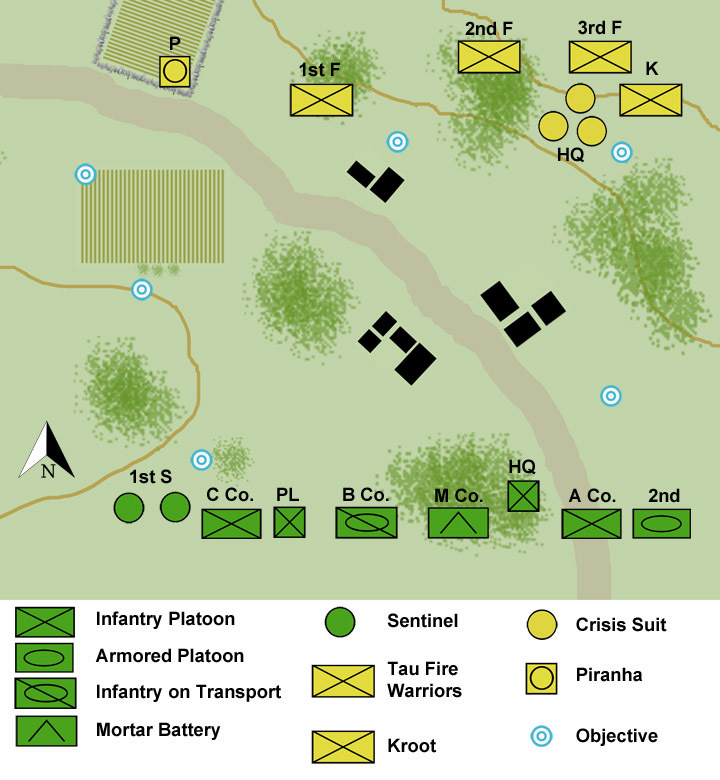 The transport-led assault drove directly into the center of the Tau line, targeting the Tau command center located in the central woods of the xeno line (Tau unit: 2nd Fire Warriors). 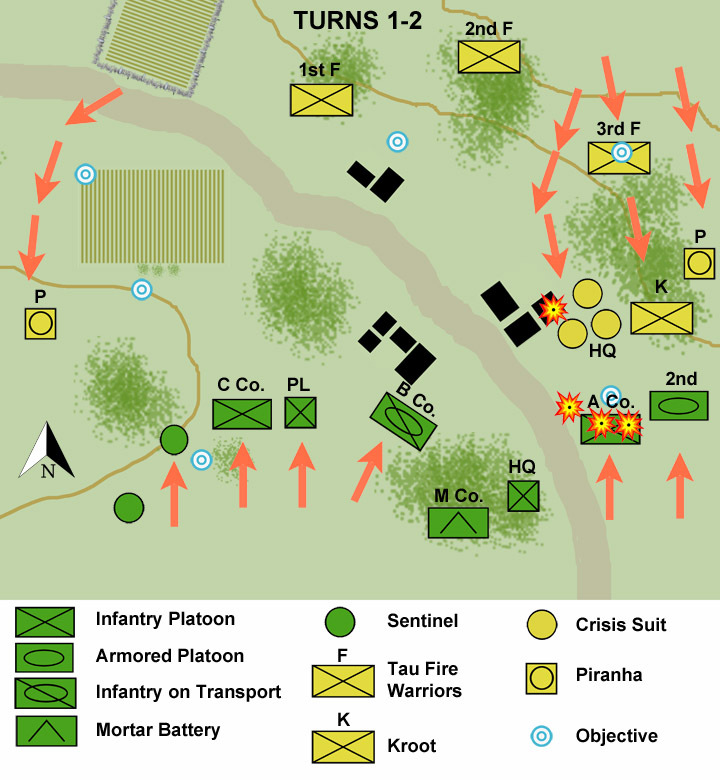 On the Imperial left flank, a flanking attack by the Tau skimmers was repulsed by one squadron of the 1st Sentinel Co., while C. Company, the 1st Platoon Headquarters Squad, and more Sentinels continued their advance to the Imperial tank wrecks, screening recovery teams who dragged the wreckage back behind Imperial lines.